There were a couple interesting earthquakes offshore of El Salvador “today.” These earthquakes occurred along the Middle America Trench, a low spot in the ocean formed by the subduction of the Cocos plate beneath the Caribbean plate (a convergent plate boundary). The subduction zone here typically generates earthquakes that are the result of horizontal compression (e.g. thrust or reverse earthquakes). Due to the slightly oblique plate convergence, along with preexisting structures (? 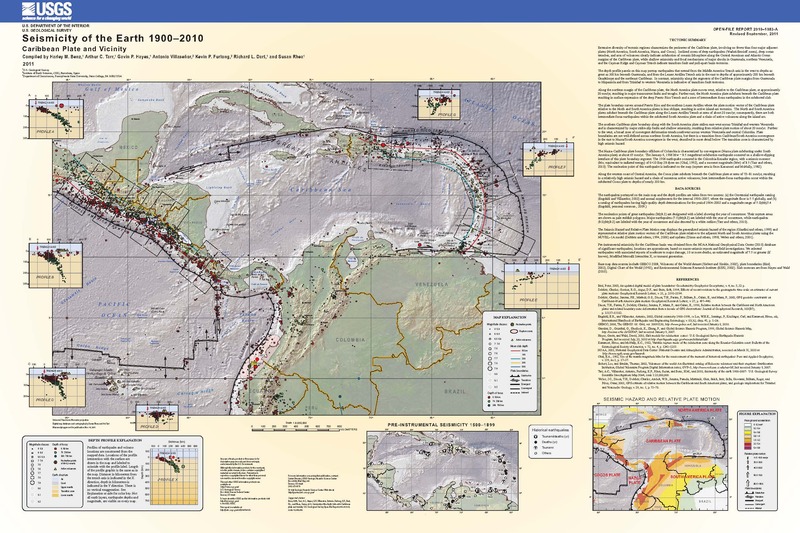 ), there is a large strike-slip fault system in the upper plate (the Caribbean plate) here. These are called forearc sliver faults. As these faults step left and right, they create basins. The forearc sliver faults are also co-located with the magmatic arc (the volcanoes formed because of the subducting oceanic lithosphere). These earthquakes may be experiencing extension for the above two reason. Alternatively, these earthquakes could be in the upper plate where the plate is experiencing along-strike (in the direction parallel to the subduction zone fault trench) extension as a result of the forearc sliver faults stretching parts of the upper plate. The orientation of these earthquakes does not preclude either of these interpretations. These earthquakes have default depths, so it is difficult to know if these are in the downgoing slab or if they are in the upper plate (Caribbean plate). Based on the seismicity from the past century (mostly M ~6 earthquakes in this region), these earthquakes are probably not foreshocks for a larger earthquake. But, a hundred years is far from enough data to really understand ANY fault system. Seismology (and plate tectonics for that matter) is just too young a science to understand these things. Maybe after a couple thousand years we will have enough data to be able to make meaningful forecasts. There was an earthquake on 2016.11.24 to the southeast of today’s sequence. Here is my report for that earthquake. Here are the USGS web pages for the earthquakes. 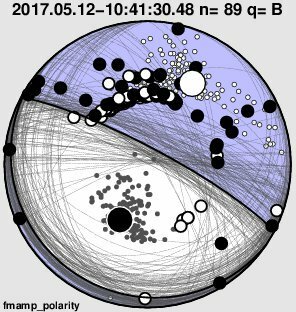 2017-05-09 14:15 M 5.2 This earthquake may be related, but probably not. I plot the seismicity from the past month, with color representing depth and diameter representing magnitude (see legend). I include MMI contours for the M 6.2. I also include USGS seismicity for the past century. Here is the kml for these USGS earthquakes for magnitudes M ≥ 7.0 from 1917-2017 that I used to make this map. In the lower left corner, I include a subset of figures from Benz et al. (2011). There is a map that shows USGS epicenters with dots colored by depth and magnitude represented by circle diameter. There is also a cross section for this region, just to the northwest of El Salvador. Cross section B-B’ shows the earthquake hypocenters along a profile displayed on the map. Note how the subduction zone dip steepens to the northeast. I place a green star in the general location of today’s M 6.2 earthquake. In the upper right corner is a tectonic summary figure from Funk et al. (2009). The authors suggest that there is a forearc sliver in this region. A forearc sliver is a large plate boundary scale strike-slip fault bounded block that is formed due to strain partitioning. When the relative plate motion at a subduction zone are not perpendicular to the megathrust fault, the motion that is perpendicular is accommodated by the megathrust fault. The plate motion that is not perpendicular to the subduction zone fault is accommodated by strike-slip faults parallel to the strike of the subduction zone fault. The authors place red arrows showing the relative motion along the plate bounding fault along the eastern boundary of this forearc sliver (these are called forearc sliver faults for obvious reasons). A classic example of a forearc sliver fault is the Sumatra fault along the Sunda subduction zone. Forearc sliver faults do not always bound a block like this and are not always parallel to the plate boundary. The Cascadia subduction zone has a series of forearc sliver faults offshore, but these are formed oblique to the plate boundary. For the case in cascadia, the plate margin parallel strain is accommodated by rotating blocks, not rigid blocks. As these blocks rotate in response to this shear couple, they rotate and form strike-slip faults between the blocks (forming “bookshelf” faults). Another plate where relative oblique motion creates rotating blocks is along the Aleutian subduction zone. In the upper left corner, I include a map from CSEM EMSC. 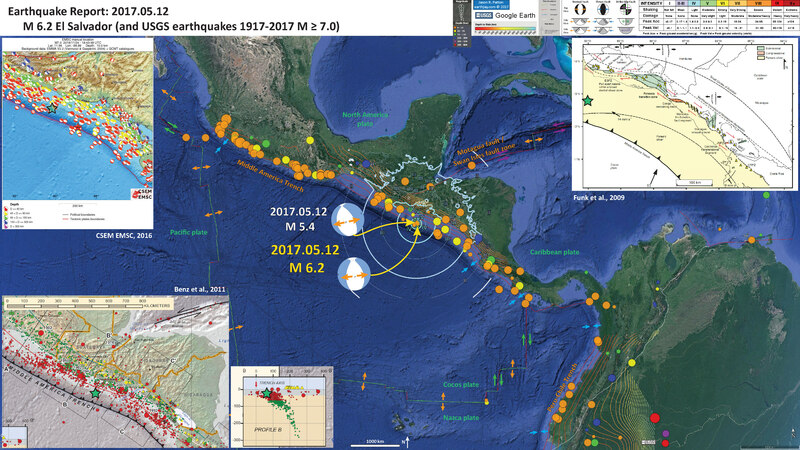 This map was prepared for the 2016.11.24 El Salvador earthquake. They plot focal mechanisms for historic earthquakes in this region. One may observe that there are compression mechanisms associated with the megathrust and that there are strike-slip (shear) mechanisms associated with the strike-slip faults on land. Here is the focal mechanism from Anthony Lomax. This orientation and sense (compression) more aligns with what we might expect for earthquakes in this region, however, note that this is still a dilatational (extentional) mechanism. Here is a figure from a recently published summary of subduction zones from Goes et al. (2017). Note the various factors and forces to which a subducting slab is exposed. Schematic diagram showing the main forces that affect how slabs interact with the transition zone. The slab sinks driven by its negative thermal buoyancy (white filled arrows). Sinking is resisted by viscous drag in the mantle (black arrows) and the frictional/viscous coupling between the subducting and upper plate (pink arrows). To be able to sink, the slab must bend at the trench. This bending is resisted by slab strength (curved green arrow). The amount the slab needs to bend depends on whether the trench is able to retreat, a process driven by the downward force of the slab and resisted (double green arrow) by upper-plate strength and mantle drag (black arrows) below the upper plate. At the transition from ringwoodite to the postspinel phases of bridgmanite and magnesiowüstite (rg – bm + mw), which marks the interface between the upper and lower mantle, the slab’s further sinking is hampered by increased viscous resistance (thick black arrows) as well as the deepening of the endothermic phase transition in the cold slab, which adds positive buoyancy (open white arrow) to the slab. By contrast, the shallowing of exothermic phase transition from olivine to wadsleyite (ol-wd) adds an additional driving force (downward open white arrow), unless it is kinetically delayed in the cold core of the slab (dashed green line), in which case it diminishes the driving force. Phase transitions in the crustal part of the slab (not shown) will additionally affect slab buoyancy. Buckling of the slab in response to the increased sinking resistance at the upper-lower mantle boundary is again resisted by slab strength. This is a summary figure showing subducting slabs and where they experience downdip extension vs downdip compression (Goes et al., 2017). Their cross section for the Cocos plate does not show any region of downdip extension. This slightly favors the upper plate forearc along-strike extensional interpretation for today’s earthquakes. Summary of morphologies of transition-zone slabs as imaged by tomographic studies and their Benioff stress state. Arrows on the map indicate the approximate locations of the cross sections shown around the map, with their points in downdip direction. Blue shapes are schematic representations of slab morphologies (based on the extent of fast seismic anomalies that were tomographically resolvable from the references listed). Horizontal black lines indicate the base of the transition zone (~660 km depth). For flattened slabs, the approximate length of the flat section is given in white text inside the shapes. For penetrating slabs, the approximate depth to which the slabs are continuous is given in black text next to the slabs. Circles inside the slabs indicate whether the mechanisms of earthquakes at intermediate (100–350 km) and deep (350–700 km) are predominantly downdip extensional (black) or compressional (white). Stress states are from the compilations of Isacks and Molnar (1971), Alpert et al. (2010), Bailey et al. (2012), complemented by Gorbatov et al. (1997) for Kamchatka, Stein et al. (1982) for the Antilles, McCrory et al. (2012) for Cascadia, Papazachos et al. (2000) for the Hellenic zone, and Forsyth (1975) for Scotia. The subduction zones considered are (from left to right and top to bottom): RYU—Ryukyu, IZU—Izu, HON—Honshu, KUR—Kuriles, KAM—Kamchatka, ALE—Aleutians, ALA—Alaska, CAL—Calabria, HEL—Hellenic, IND—India, MAR—Marianas, CAS—Cascadia, FAR—Farallon, SUM—Sumatra, JAV—Java, COC—Cocos, ANT—Antilles, TON—Tonga, KER—Kermadec, CHI—Chile, PER—Peru, SCO—Scotia. Numbers next to the red subduction zone codes refer to the tomographic studies used to define the slab shapes: 1—Van der Hilst et al., 1991; Fukao et al., 1992; 2—Bijwaard et al., 1998; Hafkenscheid et al., 2001; Hafkenscheid et al., 2006; 3—Fukao et al., 2001; Fukao et al., 2009; Fukao and Obayashi, 2013; 4—Bunge and Grand, 2000; Grand, 2002; 5—Karason and Van der Hilst, 2000; Replumaz et al., 2004; Li et al., 2008; 6—Miller et al., 2005; Miller et al., 2006; 7—Gorbatov et al., 2000; 8—Hall and Spakman, 2015; 9—Van der Hilst, 1989; Grand et al., 1997; Ren et al., 2007; 10—Van der Lee and Nolet, 1997; Schmid et al., 2002; 11—Sigloch et al., 2008; Sigloch, 2011; 12—Simmons et al., 2012; 13—Gorbatov and Fukao, 2005; 14—Van der Hilst, 1995; Schellart and Spakman, 2012; 15—Spakman et al., 1993; Wortel and Spakman, 2000; Piromallo and Morelli, 2003. Here is a figure from Dewey et al. (2004) that shows a cross section of earthquake hypocenters with symbols representing their mechanism type. There was an earthquake sequence in 2001 that had an extensional mechanism. This supports the interpretation that today’s M 6.2 sequence is in the downgoing slab. Cross section of earthquake hypocenters, 1978–April 2001, classified by focal mechanism as determined by the Harvard CMT methodology (Dziewonski et al., 1981). Events are those that lie within the box labeled “Fig. 5” on Figure 4. Hypocenters of the most destructive El Salvadoran earthquakes since 1978 are labeled by their dates. Shallow-focus earthquakes for which the hypocentroid cannot be accurately determined by Harvard CMT methodology are assigned default depths of 15 km. Dewey, J.W., White, R.A., and Hernández, D.A., 2004. Seismicity and tectonics of El Salvador in Rose, W.I., Bommer, J.J., López, D.L., Carr, M.J., and Major, J.J., eds., Natural hazards in El Salvador: Boulder, Colorado, Geological Society of America Special Paper 375, p. 363–378.